The Swedish group Abba broke out with the hit single “Waterloo”, performed at the 1974 Eurovision song contest. Abba went on to become one of the biggest super-groups of the later 1970s and early 1980s. We all remember the hits like “Dancing Queen”, “Fernando”, “Take a Chance on Me”, and “Mamma Mia”. The music of Abba went on to inspire the hit Broadway Musical “Mamma Mia”, which was adapted into the 2008 film by the same name. In 2008, even Senator John McCain confessed his love for Abba. 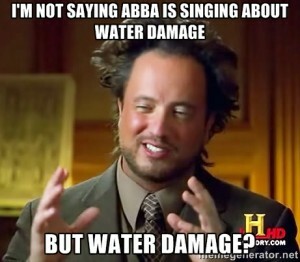 But did you know that the lyrics of Abba’s “Waterloo” contain a powerful message for those needing water damage restoration? You scoff now, but it is true. If you pay close attention to the lyrics of “Waterloo” you will find a subtle warning about the perils of water damage and many reasons to call our water damage Connecticut service. Frequently homeowners try to hold back water damage caused by flooding and storms. They use sump pumps and obsessively clean out their gutters, but sooner or later a strong storm blows through town and those homeowners finally have to face their Waterloo. They throw their arms up in the air and proclaim, “Oh yeah, and now it seems my only chance is giving up the fight.” But you don’t have to give up the fight when you use a qualified water damage restoration company in Connecticut. Sudden disasters can make you feel like you lose, even when you win, like you couldn’t escape if you wanted to, but remember when you call our water damage Connecticut techs you will never face your Waterloo alone.